Equity indices are stock market indices that are used to measure the health and value of specific segments of the stock market or the overall economy of a nation. They can be based on specific industries (for example, the NASDAQ Composite measures the overall performance of the most highly-valued IT companies in the United States) or on specific corporations that make the most impressive impact on the overall economy of a country (for example, the American S&P 500 is based on the largest 500 companies trading on the New York Stock Exchange). Who is who on the equity indices market? There are a large number of equity indices that you’ll want to be at least vaguely familiar with to be an effective trader with Genetrade. The following are six of the world’s most important stock indices and what they monitor. S&P 500The S&P500 is an American index founded by the Standard & Poor’s Financial Services LLC in 1957. The S&P 500 tracks the market capitalizations of 500 of the largest companies traded on the New York Stock Exchange. The S&P 500 is one of the most important indices when it comes to the American economy, as it encapsulates about 75% of the equity on the American market. NASDAQ CompositeThe NASDAQ Composite consists of 107 of the most power non-financial companies listed on the NASDAQ Stock Exchange. The NASDAQ Composite is heavily composed of companies whose focus is on information technology. Nikkei 225The Nikkei 225 (commonly referred to as simply “Nikkei” is an index that tracks the Tokyo Stock Exchange. Japan is one of the largest equity powerhouses in the world, with over US$4.09 trillion in market capitalization. FTSE 100The FTSE 100 stands for Financial Times Stock Exchange 100 Index, and tracks the top 100 corporations trading on the London Stock Exchange. ASX200The ASX 200 weighted stock market index devoted entirely to stocks being traded on the Australian Stock Exchange. A growing entity in the world of stock trading, Australia’s equity is growing quickly, and the Australian Securities Exchange sees an average daily turnover of US $4.685 billion in a single day. HSIThe HSI tracks the 50 largest companies trading on the Hong Kong Stock Market. Hong Kong has Asia’s second largest stock exchange, and the world’s sixth largest, so the HSI is definitely nothing to sneeze at. The HSI will likely continue to play a major role in upcoming world finances as well. As you can see, every major country has at least one stock index intended to track the performance of the major corporations that trade on their exchange. This means that investors can place their money into the stock market of a particular nation if they believe that an economy will perform especially well in the coming years by purchasing mutual or exchange traded funds that track the indices of the nation in question. Because the United States has the top two most important stock exchanges in the world (the New York Stock Exchange and the NASDAQ), the United States also has many more indices devoted to tracking the performance of subsets of the market. What causes an index to go up or down? Many beginning traders make the mistake of believing that the calculation of an index is calculated simply by adding the value of each stock on the index and dividing by the total number of stocks on the equity index (for example, 500 for the S&P 500). However, the true calculation process is much more complicated thanks to the fact that each index encompasses corporations that vary wildly in value when compared to one another. It is simply not accurate to weight each corporation’s stock as contributing equally to the overall health of the index when the value of each corporation is not the same. Accordingly, moves on the stock market will disproportionately affect the performance of the index overall in accordance with the size of the corporation and the direction of their stock. For example, if a very highly valued corporation is involved in a public scandal and sees the value of their stock crash, the entire index will likely go down in value, regardless of if many minor players are seeing the value of their stocks increase. Similarly, highly valued stock can also carry an index, even when smaller corporations are suffering. It’s important to remember that the equity indices are intended to track the performance of the market as an entire entity; they are not indicative averages of the individual corporations. Why trade Equity Indices with Genetrade? Trade equity indices with Genetrade, and instantly get connected to economies all over the world. 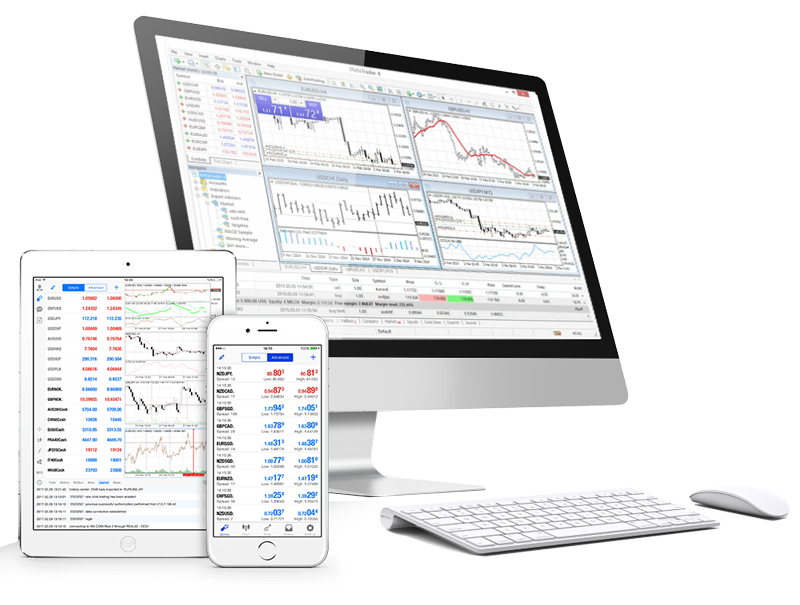 Access a wide range of desktop, web and mobile trading platforms which are designed to deliver best in class experience.